Each month, we’ll be featuring an interesting antique item which appeared in one of our past auctions. This item has been sold. In bookbinding, a dos-à-dos binding (from the French term meaning “back-to-back”) is a binding structure in which two separate books are bound together so that one edge of a book is adjacent to the spine of the other book, with a shared board between them serving as the back cover of both books. This lovely example offered here is ornately embroidered with delicate flowers of gold, silver and colored thread. 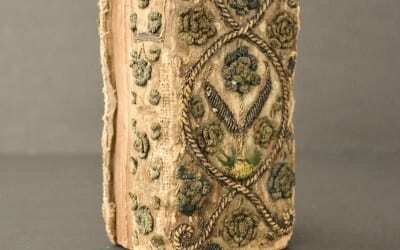 The book’s fore edges are both gilt and gauffered; the main design on the front and back boards is an intricately embroidered floral pattern surrounding a large single flower. Flower buds decorate the book’s two spines. The first book bound is The New Testament of Our Lord and Saviour Jesus Christ Newly Translated out of the Original Greek. Imprinted at London by Robert Barker Printer to the Kings most Excellent Majesties John Bill 1630. The second book is The Whole book of Psalms Collected into English Meeter by T. Sternhold, I . Hopkins, W. Whittingham and others Newly set forth and Allowed to be sung in all Churches 1632. Complete with all music.